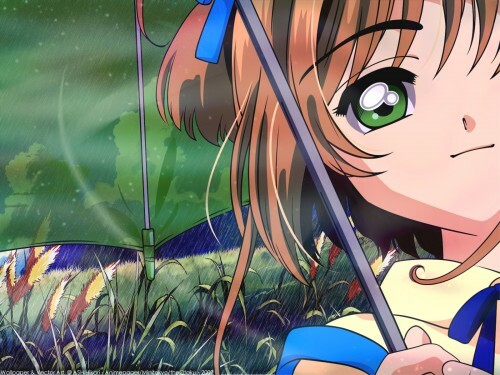 Cardcaptor Sakura Wallpaper: . ::Only Happy When It's Raining::. Minitokyo »	Cardcaptor Sakura Wallpapers » Cardcaptor Sakura Wallpaper: . ::Only Happy When It's Raining::. I've always thought that the scan of Sakura that this came from was so pretty, I decided I wanted to wall it. First I vectored the part of the scan I wanted to use. Big vectors are so fun :). The scan had a bit of a sketchy look different from most CCS scans, and I tried to keep that look in certain parts of the vector. I had to extend the umbrella since it didn't go that far in the scan. After the vector came the walling. I actually finished this vector on May 7th, and since then I've been trying to make a suitable background for it. Took a while, I tried so many different ideas. The one I finally settled on was this one. The scenery in the background is mainly from a scan at MT. The rain was made by me, and I added some minor brushwork/texture over the whole thing to give it a more mystical look (it may look odd, but it's there). You may think I just pasted a vector on a background and added the other stuff, but I actually spent over an hour editing the colours and effects of the vector and background to make them match and to fit my scene. I tried to create a scene of Sakura walking in the rain at night with the moon shining oh her. Anyways this wall could probably be better, but this was my best. Hope you all enjoy it, thanks for any comments, faves, and full views. The only problem I thought was maybe how the sky looked quite plain. Maybe add some stars to it and it'll look better. The grass might've been quite bright so it needs to be a little darker since the sky is dark. 4.1/5 Stars i can give it to you ^^.. Very nice vector, always clean and smooth. comes in looks kinda weird with the rain coming. The bg is really nice and match with the chara XD. + the transparent of the umbrella is really amazing. beautifull wallpaper! I really love sakura.